We think you'll find that the lovely grounds and indoor facilities at the Country Inn create an incomparable setting for corporate meetings, reunions, and special anniversaries. If you don’t see what you are looking for, just let us know. We'll be happy to custom design a menu just for you. Our menus are inspired by the seasons, the Pacific Northwest, the pacific rim, French, Italian & Mediterranean specialties, as well as fine American cuisine, and the beautiful setting of the Country Inn. 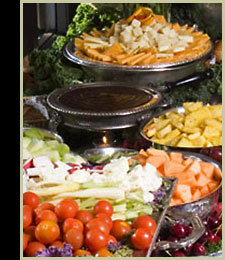 Fabulous buffets, beautifully decorated and presented, formal sit-down dinners, lavish hors d’oeuvres. Complete set up & service. beverages, fresh brewed coffee and tea. standard linens and table settings. Professional, well groomed & uniformed, licensed & insured service staff.